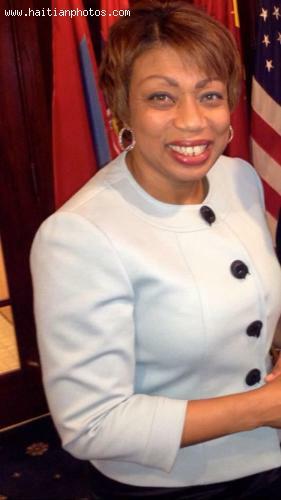 According to the Communication Office of the Haitian Prime Minister, Bernice Phidelia, the Minister of Haitians living abroad, gave her resignation, Monday, June 10, 2013 to Prime Minister Laurent Lamothe. The Minister of Foreign Affairs and Religious Affairs, Pierre Richard Casimir will be assuming this function until further notice. In less than six Months on the job, the Minister of Haitians Living Abroad, Bernice Phidelia had to call it a quit. She had taken office on 25 January 2013, following another cabinet reshuffle where she replace Mr. Daniel Supplice. Bernice Phidelia left her position after accusations have been mounting against her that she nationality other than Haitian. According to Senator John Joel Joseph, she has dual nationality. The question of the nationality of members of government has been raised. Some Haitian lagislators cast doubt on the citizenship of two ministers of the current government, the sports minister, Magalie Racine, and the Haitians living abroad, Bernice Fidelia. There are also ongoing suspicions about the citizenship of President Michel Martelly and Prime Minister Laurent Lamothe. Is it OK for a member of the Haitian government to hold a foreign nationality? Can the Haitian Prime Minister have dual Citizenship? Is it OK for the Haitian President to have dual Citizenship? The brain drain of Haiti has long been talked about and this is a reality that the Haitian government should face and embrace. By definition almost the position held by Dr. Fidelia is one that requires an individual who has lived worked outside of Haiti. How else could that person be in touch with the Haitian Diaspora? To now question whether the person who held that position possesses a non-Haitian passport is to ignore the role and scope of the position of which that person holds. give one Haitian currently living in Haiti that can be a good president? I couldn't cume up even with one. all the politicians you see on the radios making noises are just opportunists. they will not do any better than Martelly. Please give my beloved country a chance. If you don't accept Haitians in the Diaspora to be in the Government, Haiti will not go anywhere. In the United states alone, you have an estimated 2 million Haitians. We in the Diaspora fought hard for this. There is no longer Non-Haitians. This is what the new constitution say. It allows for dual nationality, which has long held up questions of land ownership and bids for public office. I don't understand this, didn't the new constitution give the diaspora lots of Rights in Haiti? From what I know, Haitians living abroad have the right to own land and run for lower levels of. So why can't they be Cabinet Ministers. They are more qualified to begin with. We need to vote, we need to have the power to govern Haiti. Most Haitians in Haiti are very narrow minded.